Old City hall with Cenotaph. 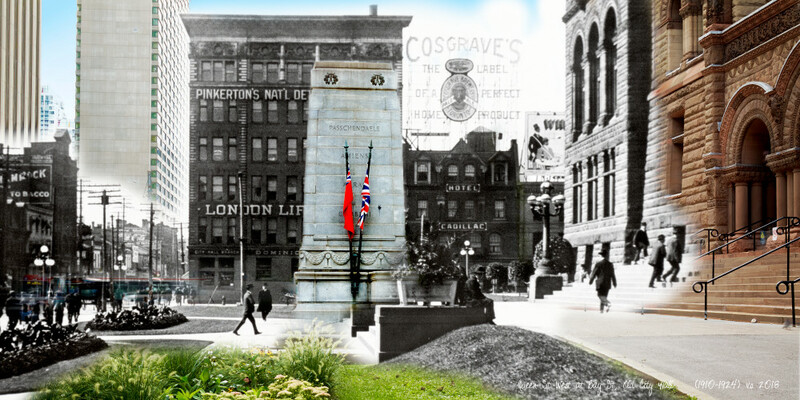 Originally dedicated to those who fell in World War I, the cenotaph located in front of Old City Hall was added in 1925. The winning architects, W.M. Ferguson and T.C. Pomphrey, were awarded $2,500 for the design, as the result of a competition. Made from granite cut from the Canadian Shield, the cornerstone was laid July 24th 1925 by Field Marshall Earl Haig. It was unveiled on November 11th 1925.